My latest research brief looks at Senate Bill 527, which would allow reflexologists to practice in North Carolina without a license, if they’re certified by the American Reflexology Certification Board. It’s a good start. Reflexology doesn’t even appear on the NC Commerce Dept.’s list of 181 “Occupations Requiring a License in North Carolina.” But reflexology still falls within the broad scope of practice defended by the Massage and Bodywork Therapy licensing board, so reflexologists currently can’t practice in North Carolina without a massage and bodywork therapy license. Basically, there’s no need to hamstring a speciality because of a turf war with a licensing board. That’s what teeth whiteners faced and what hair braiders still face. And goodness, who knows how many others there are? So it’s a good idea to give reflexologists freedom from licensing. But why stop at requiring certification? Voluntary certification would address the bill’s concern as well as balance the public’s interest in finding qualified, trustworthy service professionals with the state’s interest in protecting competition and individuals’ right to earn a living. In October, New Mexico Gov. Susanna Martinez incorporated that reform into a sweeping occupational licensing reform Executive Order. 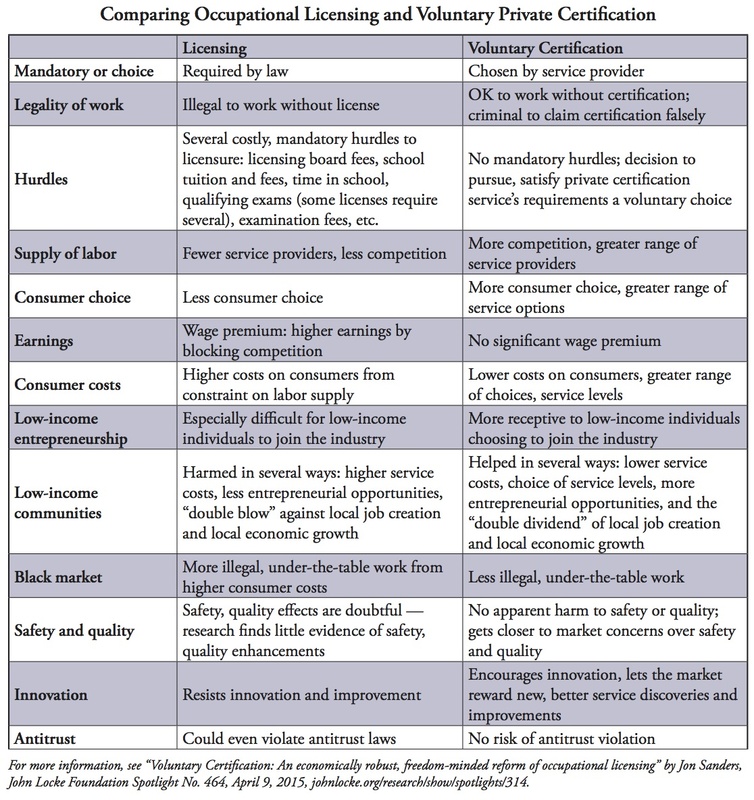 See an earlier research brief for more discussion of occupational licensing consumer choice.